Low Carb Sweet Potato Casserole – a tasty and lightened up version of the classic comforting side dish perfect for any Thanksgiving holiday table. Best of all, it’s healthy and easy to make with a crunchy pecan topping that is sugar free, keto & paleo-friendly. With Thanksgiving just a week away, I’m sharing a few more keto versions of some classic holiday side dishes. 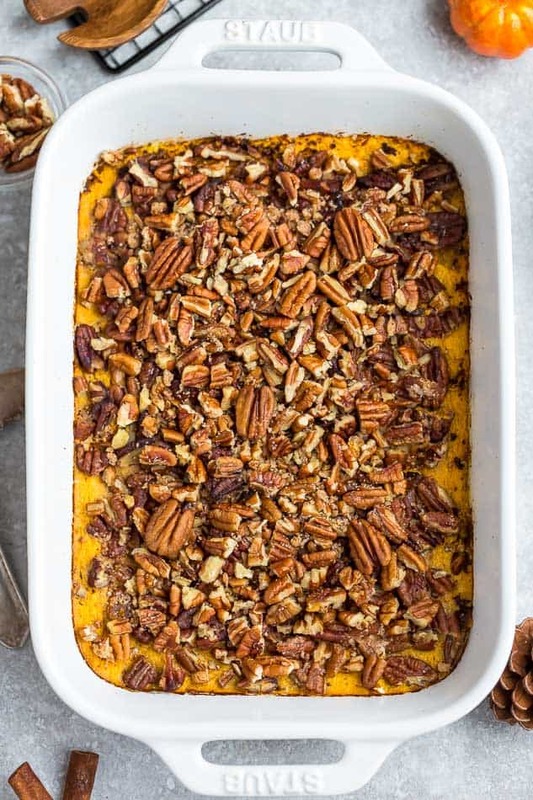 Sweet Potato Casserole is a classic Thanksgiving side dish and this Low Carb Sweet Potato Casserole would make a delicious addition to your holiday table. Just like my slow cooker sweet potato casserole, this one is also gluten free, grain free and dairy free. 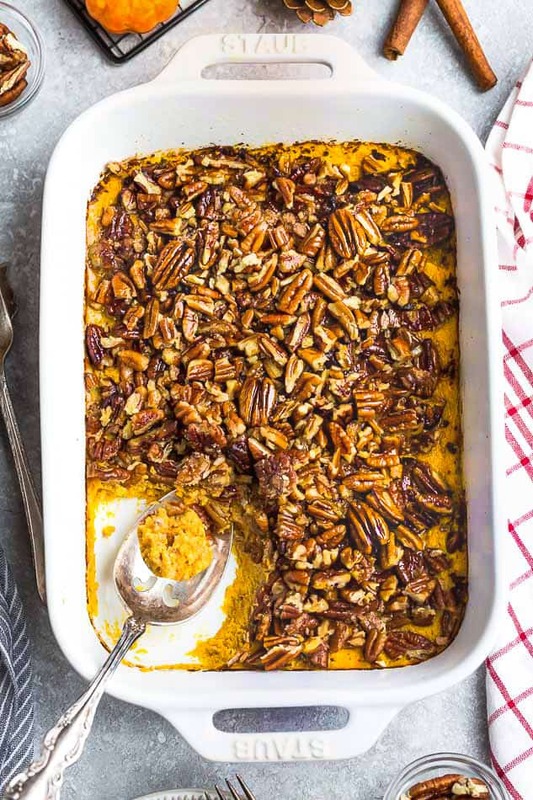 Low carb sweet potato casserole is also sugar free so it’s diabetic-friendly and can fit into a ketogenic and paleo diet. And the best part? This healthy sweet potato casserole can be made ahead of time the night before to save you extra time and stress on the big Turkey day. You can prep everything ahead and store the casserole in your refrigerator. 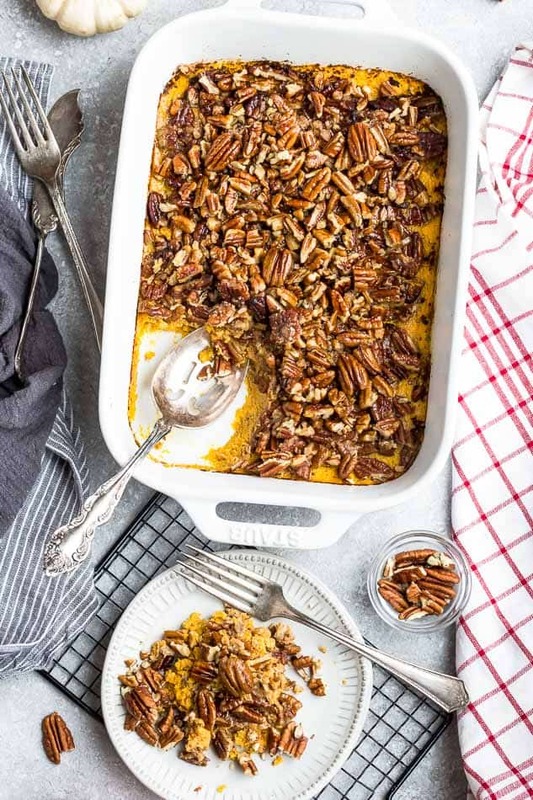 WHAT INGREDIENTS ARE IN A SUGAR FREE SWEET POTATO CASSEROLE? 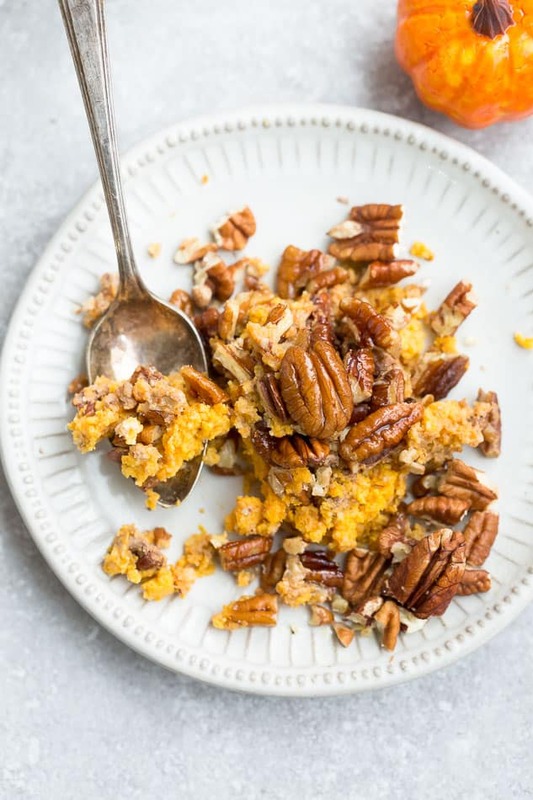 This keto sweet potato casserole uses pumpkin and riced cauliflower to mimic that color and texture of sweet potato. Pumpkin is one of the winter squashes that are lower in carbs and can still be enjoyed when following a ketogenic diet. 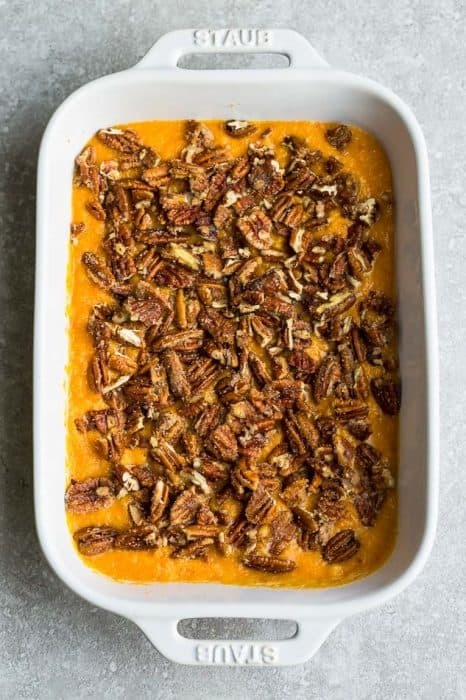 To make this paleo sweet potato casserole, you’ll start with about 1 1/2 lbs (3 cups) of pumpkin. You can cook them however you like, until they are soft and tender. I buy mine pre-cut from the grocery store and then roast them in the air fryer or oven. It takes about 20 minutes or less. If you want to simplify this easy side dish even more, feel free to use pure canned pumpkin puree. 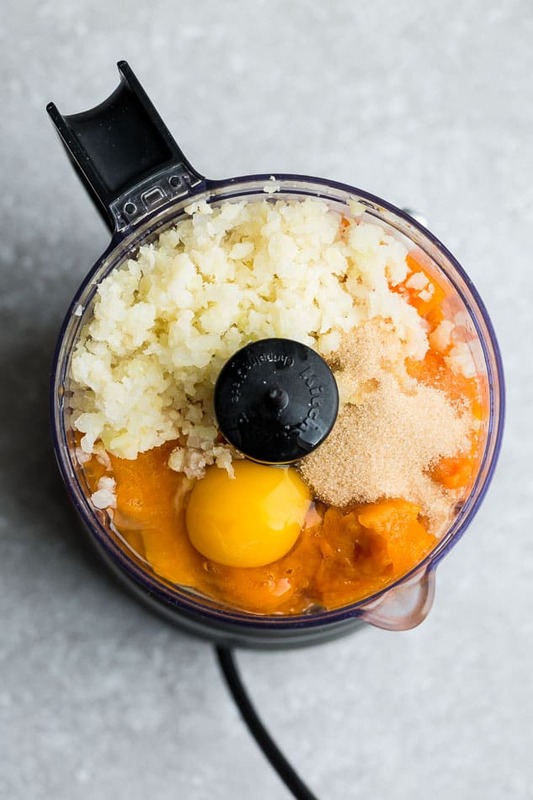 Next, you’re going to add the pumpkin to a food processor along with riced cauliflower (you can buy frozen and thaw it out or use fresh steamed cauliflower), a couple of eggs, almond milk, ghee, sweetener, vanilla, cinnamon and a little bit of salt. We prefer our casserole lightly sweetened but feel free to add more if you prefer your casserole on the sweeter side. Once everything is all mixed up, spread into a greased 9 x 13 casserole pan. 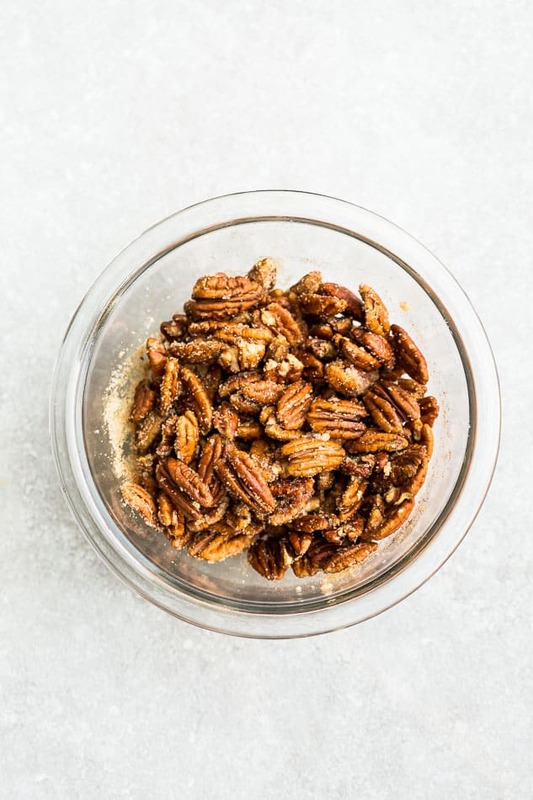 Then you’re going to make the crunchy pecan topping which is just a combination of pecans, golden monk fruit sweetener, cinnamon, ghee, cinnamon and nutmeg. Bake in preheated for about 35-40 minutes, or until the center is set and the topping is golden brown. Allow to cool and serve. 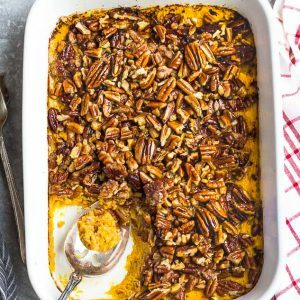 The great thing about this make ahead sweet potato casserole is that it can keep in the refrigerator in an airtight container for 2-4 days. The beauty of sweet potato casserole is that you can assemble the casserole ingredients ahead of time to freeze for later. 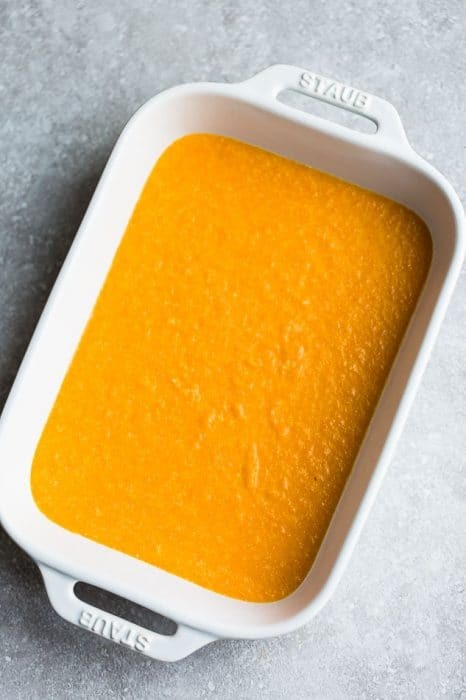 The pumpkin cauliflower puree is freezer friendly so all you have to do is transfer the mixture to your casserole pan then cover and store in the freezer. Simply mix up the topping right before you bake it. Low Carb Sweet Potato Casserole - a tasty and lightened up version of the classic comforting side dish perfect for any Thanksgiving holiday table. Best of all, it's healthy and easy to make with a crunchy pecan topping that is sugar free, keto & paleo-friendly. Preheat oven to 350 F. Lightly grease a large oven-safe casserole dish (about 9x13) and set aside. Add the pumpkin, cauliflower to the bowl of your food processor. Pulse until smooth. Add ghee, milk, sweetener, eggs, coconut flour, vanilla and salt and process until smooth. Transfer to casserole dish and smooth the surface. (You can make the casserole up to this point the day before serving if desired. Just cover the baking dish and refrigerate). Combine pecans, ghee, sweetener, cinnamon, vanilla, nutmeg and salt and sprinkle evenly over the casserole. Bake in the preheated oven at 350 F for 25-30 minutes, or until center is set and the pecans are golden brown. Remove from oven and allow to set for 5 minutes.